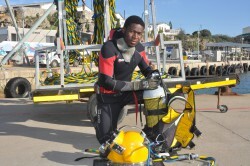 Twenty-five year old Brian Sishi who is involved in diving, harbour maintenance work and ship repairs is but one beneficiary of the National Youth Development Agency’s (NYDA) Thusano Fund who can now count himself among thousands of young South Africans living their dreams. The Thusano Fund, meaning helping hand, is an initiative aimed at addressing the day to day needs of young people in ensuring that youth are skilled and educated. Brian received R46 650 in funding from the NYDA to complete a two month long diving course which has enabled him to now work as a welder, cutter and general maintenance employee on ships and as a harbour repair worker under water. “Most black people are not exposed to marine life and open waters, this is a shame as there is so much potential to be explored in the harbours of South Africa especially in Durban,” says Brian. When asked how he got exposed to diving Brian said that after school while living in Chesterfield, KwaZulu Natal he attended a first aid course where he met a man involved in recreational diving who exposed him to what later became his biggest passion. According to the NYDA Executive Chairperson Yershen Pillay, “We are inundated with requests from young people who display great potential but merely require funding to complete a short course that could change their lives and NGO’s doing phenomenal work under serious financial constraints. The Thusano Fund, as a special project of the NYDA, has supported numerous beneficiaries to date and we receive letters of gratitude daily from our recipients across the country proving that the Thusano Fund, along with all the NYDA’s products and services, are in fact changing the lives of South Africa’s youth.” Brian plans to complete an additional qualification in deep sea diving as he is only currently permitted to work in shore with his existing training. After this, he dreams of travelling and working abroad to gain more experience before settling down to work in South Africa again.